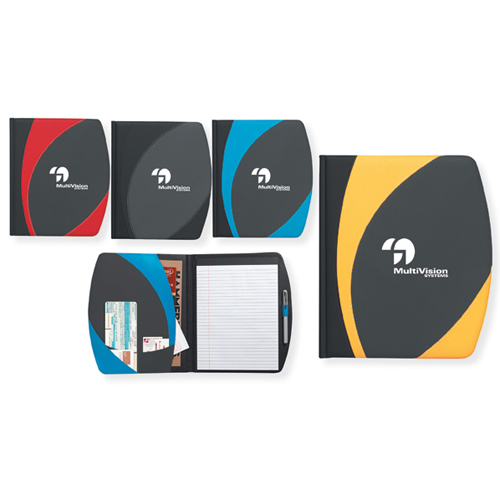 Spin Doctor Writing Pad with Grip Roller Pen Great give-away for conventions.Features interior organizer with large document pocket, dual business card pockets, small corner slip pocket , 8 1/2" x 11" writing pad and pen. Writing pad colors with black and charcoal: Red, Black, Bright Blue and Goldenrod. Pen Colors: Navy, Charcoal, Light Gray and Black. Pens have Black ink and are unimprinted and inserted into the writing pad pen loop. BIC Grip Roller pen inserted into the writing pad pen loop. Pens are available in navy, charcoal, light gray and black. Please specify color on your order. If not specified, a black pen will be used. Pens include black ink.